Is Your First Aid Kit In Compliance? Do You Need to Have a First Aid Kit? 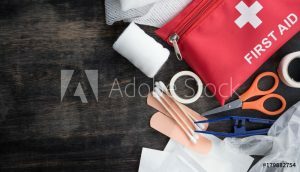 You can find a basic minimum standard first aid kit in American National Standard (ANSI) Z308.1-1978. Additional requirements apply to more hazardous workplaces. Over the counter medicines are fine for inclusion in first aid kits but avoid medications that could cause drowsiness: If a worker takes one of these and has an accident soon afterwards, the implication could be that you as the employer may be culpable. You may only include medications wrapped in tamper-evident packaging as individual doses. You should not have any bottles. If you reasonably expect workers treating other injured employees could come into contact with blood or other pathogens, you should also consider including personal protective equipment, such as latex gloves, masks, gowns and face shields. Additionally, if your workplace contains caustic chemicals or HAZMAT, you should also make flushing or rinsing stations available for workers (OSHA Standard 1919.151(c)). …and then include the minimum fill contents as described above. Labeling must be permanent and in at least a six-point font. Complying with the thousands of occupational health and safety regulations is a full-time job for many employers. If you have a fair number of employees, consider appointing a safety manager. This reliable individual can be responsible for creating a means to track current first aid, CPR, HAZMAT and other certifications, as well as arranging for training for individuals and supervisors. Other possible responsibilities include inspecting first aid kids and ensuring they are adequately stocked, keeping up with new developments in the field of occupational safety and health, making recommendations to management, and documenting the firms’ OSHA and state occupational safety and health compliance efforts. For more information, visit the Occupational Safety and Health Administration’s website at www.osha.gov, and your state’s Department of Labor, which may have more specific requirements than the federal law.